Who doesn’t love North America’s largest owl? 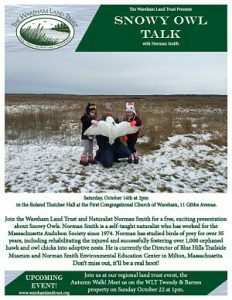 The Wareham Land Trust is thrilled to sponsor this program with Norman Smith, Director of MA Audubon’s Blue Hills Trailside Museum. 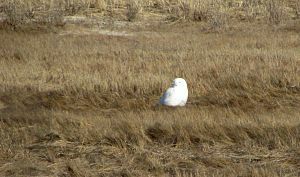 Norm has been studying snowy owls and working to protect them since 1981. As part of his research, he attaches bands and transmitters to snowy owls at Boston Logan International Airport, and then tracks their travels. 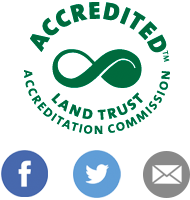 There is information about their ongoing work as well as video of a snowy owl release at the Audubon website. Please join us for this informative and fascinating discussion about how we can both admire and protect this beautiful bird. Light refreshments will be served. 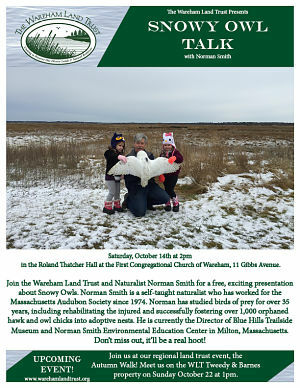 Saturday, October 14th, 2:00 p.m. at the Congregational Church hall, 11 Gibbs Ave, Wareham.